You’d think that just a few days before Memorial Day weekend you could count on the weather to be fairly spring-ish. And until this morning, the weather has actually been quite summery here in northwest Montana. So imagine my surprise this morning when I awoke to snow on the ground! It rained all day yesterday (in torrents, at times), and turned to snow overnight. All the poor trees and plants in the area were looking pretty droopy and pathetic. One of the first things I did was go outside in the backyard and beat snow off the willow tree, then went to the front yard to dust off the bushes in the bed in front of the porch. There are downed branches, big ones, all over town. Ahhh, spring in Montana. Of course the forecast is for 70s by Monday. 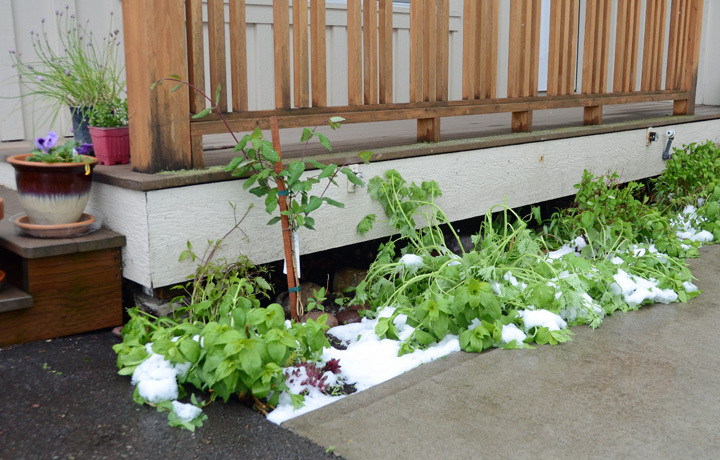 Frankly we were glad of the snow despite worrying about the plants in our yard and at the community garden. It gave us the excuse to cozy up on the couch this morning while the Peanut napped. Big Country looked at land and houses for sale (no, we’re not in the market for buying our own house yet, as much as I WISH we were… we just apparently like to torture ourselves by looking… sigh…), and I added a few more rows to the ripple blanket I’m working on (which has been much neglected since the weather has been so nice). It was a nice change from yesterday… I had food poisoning and when my body wasn’t trying to get whatever it was that didn’t agree with me out any way possible, I was sleeping. Yesterday felt like such a waste of a day, but being able to cuddle with my lovely hubby this morning was just what the doctor ordered. The snow is now melted, which makes me glad. Looking forward to sunshine this weekend! I have a whole new appreciation for these crochet thread snowflakes. They take forever! I think each of the two I made took nearly three hours. These yarn snowflakes on the other hand I can whip up in about 15 minutes. These are my two of my cousins and my sister (in the middle) with their matching ear warmers. Here’s where I found the pattern. Currently I am working on a hat for a friend who is expecting a daughter in February, two sweaters for my son (one knitted, one crocheted), and finishing a star garland that is holiday festive. I plan to have the latter finished by tonight or tomorrow afternoon before the New Year’s Eve party my husband and I are throwing. We’re excited for the party and for the fact that we’re going to celebrate the new year at about 7 p.m. so that all of our friends (the majority of whom have babies/kiddos) can go home and go to bed. When you’ve got a little boy who wakes up between 5 and 6 a.m. every day, watching the ball drop at midnight (oh and we don’t even have a TV to do that, whoops) is pretty unimportant compared to 8 hours of sleep. I love these little projects. I’m a stay-at-home and craft all day sort of person, but I only allow myself to do that sort of thing in the winter months because it’s just too nice where I live in the summer to stay inside and craft. Summer is for gardening and hiking. I’ll post more about my star garland soon. I’m going to post something of a tutorial for it. I found the tutorial elsewhere, but it’s in Australian crochet terms, which are a bit different than American, and I’ve streamlined/made less confusing some of the steps. I post a link to the original, of course, but I’ll update the tutorial. It’s a quick and easy garland that can really add some festive this time of year. My reading has changed a lot since my son was born. Used to be that I could dash through two or so novels a week. Now if I finish a novel in a month, I’ve clearly had a lot of time to read! I’m re-reading Little Women right now, which is one of my favorite books (and movie! – the one with Winona Ryder) for sentimental reasons. I love that my copy of the book has an inscription from my aunt, who gave me the book a decade ago. I have ever so many other books on my reading list, and am supremely grateful for the Amazon gift card I received for Christmas for buying books! I try to use the local library as much as possible, but with my reading time so brief every day I often have to return the books I’ve checked out before I’ve finished them (or sometimes even cracked the cover). And I also try to patronize our local book stores (we don’t have a box chain bookstore here anymore… which is so completely awesome) too, but you can’t argue with gift cards! I need to be better about updating my “What I’m Reading” tab on this blog… but I don’t get much reading in these days so that’s why it doesn’t change much! I also have subscriptions to the New Yorker magazine and High Country News magazine, so I try to get those read too. Rounding the corner to writing letters: I love to write letters (the snail mail variety) and trade frequent letters with a friend who lives in the mountains in Colorado. We’ve been writing each other letters since college. I have a shoebox stuffed full of letters from her and need to catalogue them in a binder one of these days. I also try to write semi-frequent letters to my grandmother, and to several other friends who I know appreciate that sort of thing. I just picked up a new pen for my letter writing and can’t wait to bust it out (yes I have to have a specific pen for letter writing or it’s just not as enjoyable). I also have scads of thank-you notes to write for Christmas presents. I was raised that one MUST write thank-you notes for Christmas and birthday presents and while I loathed writing thank-you notes for years, now I’m appreciative of the fact my mother made me write them. It’s a little gesture that means a lot. Just like a letter. Finally, winter is a time of reflection. It’s for thinking about the year gone by (and holy moly was this an epic year), and thinking of the year to come. It’s for sitting in living rooms watching the snow fall. It’s for visiting friends and talking about what they’re reflecting upon to. Few things are closer to heaven for me than sitting with good friends engaged in good conversation in front of a fireplace or wood stove while the snow falls without. Seriously blissful. I have two New Year’s resolutions this year. And I’m not a resolutions sort of person, but this year it just feels right. 1. Do yoga 2-3 times a week. There’s a yoga studio/wellness center in my town that has yoga classes three times a week for $7 a class. I can’t wait to start on Wednesday. For me, yoga is good, low-impact exercise. And I need flexibility and centeredness back in my life. 2. Write. Every. Day. EVERY DAY. I have three novels in the works (one fiction, one historical fiction, one gothic children’s fiction) and they’re never going to get done if I don’t work on them diligently. So my goal is 500 words (one page in Word) every day. I’ve already started this resolution and today is day three of success. So there, I did it. Snuck a post in this December. Whew. It was getting down to the wire there, folks. Happy New Year! I have a feeling 2013 is going to be pretty rad. Oh, poor neglected blog, I’m sorry I’ve been absent. Just the usual excuses, as usual. One of my goals this year has been to neglect my blog less, because if I want people to read it, I need to post more often! So I keep telling myself to post more often and then I don’t. My lack of posts recently has been due to the fact that I don’t have much to write about (unless you all find government permitting paperwork absolutely fascinating). I also always try to include photos with my posts because I think posts with photos are more interesting, but perhaps I should loosen my standard a little and include more “just writing” posts here and there. Many of my favorite blogs have frequent “just writing posts.” Hmmm. Decisions, decisions. But enough musing-while-blogging and onto actual blogging. Anywho, I thought I’d put up a quick post about two easy autumn decorating tips on the cheap. And I mean cheap. FREE actually. I have a hollow glass lamp (from Target … I covet the Pottery Barn ones, but the Target one was much more in my budget when I bought it a few months ago), which is awesome because I can fill it with seasonal decorations. For autumn, I filled the base with red and yellow leaves I picked up from trees in town. That’s free decorating tips number one. I’m sure you also have lots of trees dropping leaves where you live (well, unless you live in the southern hemisphere or somewhere that palm trees are predominate). Take a stroll down the block and pick up some pretty leaves. You can do as I have done and fill a hollow glass lamp, or put the leaves in a glass hurricane or mason jar. Put the leaves behind glass in a frame. Get creative, but do it on the cheap! Decorating tip number two is to find some bark from a tree and wrap it around a candle. 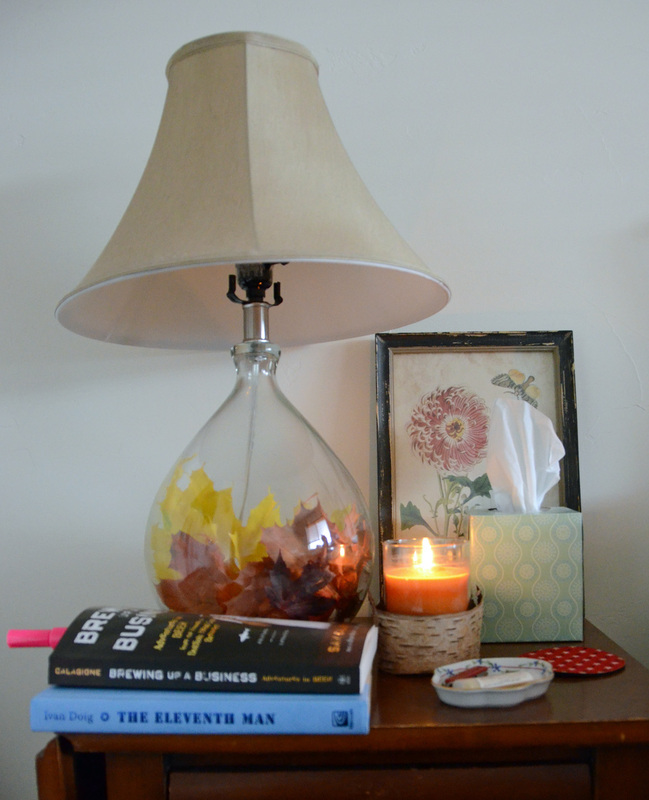 As you can see, there is birch bark around the candle on my nightstand. I found the birch bark in the forest nearby on a hike. I’ve seen in magazines lately that faux birch candles are pretty popular. But if like me you don’t have $20 to spend on a faux birch candle, you can fake it. If you have woods near where you live, you can easily pick up some fallen bark and wrap it around a candle to the same effect! Edit: As a friend pointed out, I’m faking a fake candle with something real. LOL? 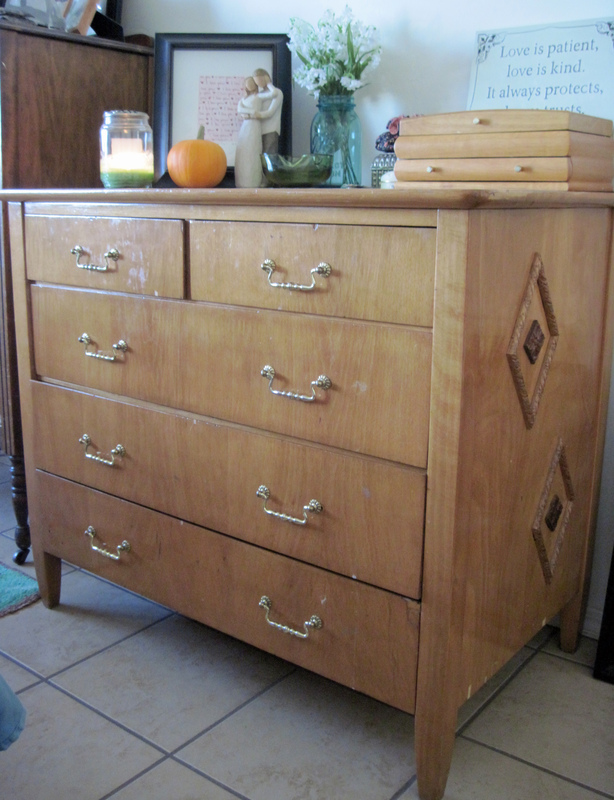 This week, after trolling Craigslist for a while, I found a $50 antique dresser for sale. I snapped up the dresser and THE SAME DAY sold my old armoire for $75, which was a nice piece of furniture but was also a hand-me-down and just wasn’t my style. So here’s some photos of the dresser. Consider these the “before” shots. I’m planning to sand the dresser, re-stain it a different color, and also line the drawers with some nice paper (using Mod Podge like the last post). My goal is to make it something I will like for a while, but also something I can pass on to my kiddo once my husband and I can actually shell out the clams to buy a matching bedroom set (oh, some day!). So it has to be something I like, but also something not too feminine. 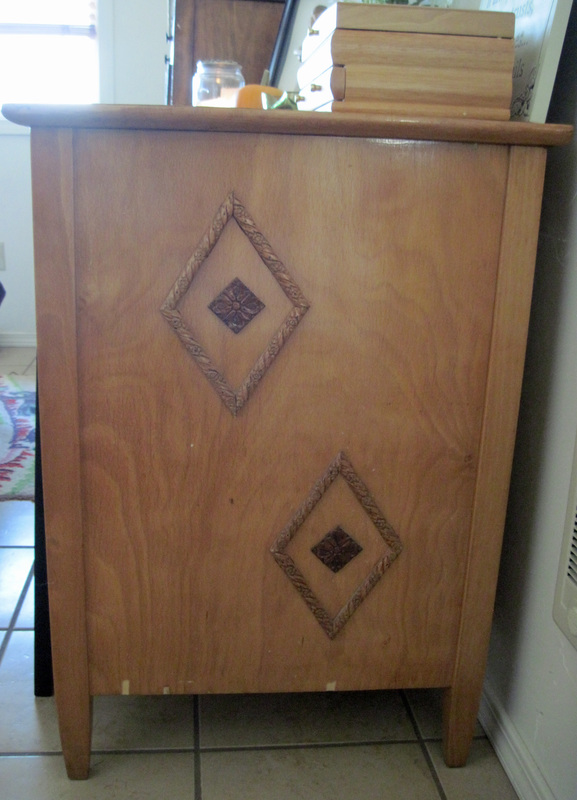 The only thing I dislike about the dresser is the diamond accents on the sides. Unfortunately them suckers are GLUED on like that sort of thing is never going out of style. So I need to figure out how to pop them off without ruining the veneer. Any suggestions anybody? But enough yakking. Here’s the “before” dresser. Stayed tuned for the “after”! My favorite part of the dresser so far is being able to put by jewelry box and some nice decorative things on top. Couldn’t do that very easily with my armoire because it was so tall. That might be the world’s longest blog title. Breastfeeding moms out there, I’m sure you understand. Anyway, this was a quick little project I did to make sure my husband and I don’t confuse our different coffees since the beans are kept in identical canisters. I drink decaf, both because I’m breastfeeding and also because caffeine does weird things to me that don’t bear mentioning on this blog. My husband, the lucky b@stard, drinks caffeinated like a normal person. I suppose the perk for me is that when I absolutely need some caffeine, it actually works! First I chose two fun papers I had in my stash for the lid tops. I meant for the purple one to go on my canister and the yellow on my husband’s so we could associate the sunny yellow lid with caffeine and the moody, purple lid with decaf, but it turns out the canister lids are not interchangeable between the jars. So until we both run out of coffee and can swap the jars, it’s the opposite for now: my decaf has the yellow lid and Shawn’s the purple. I traced the circles with a coffee mug. 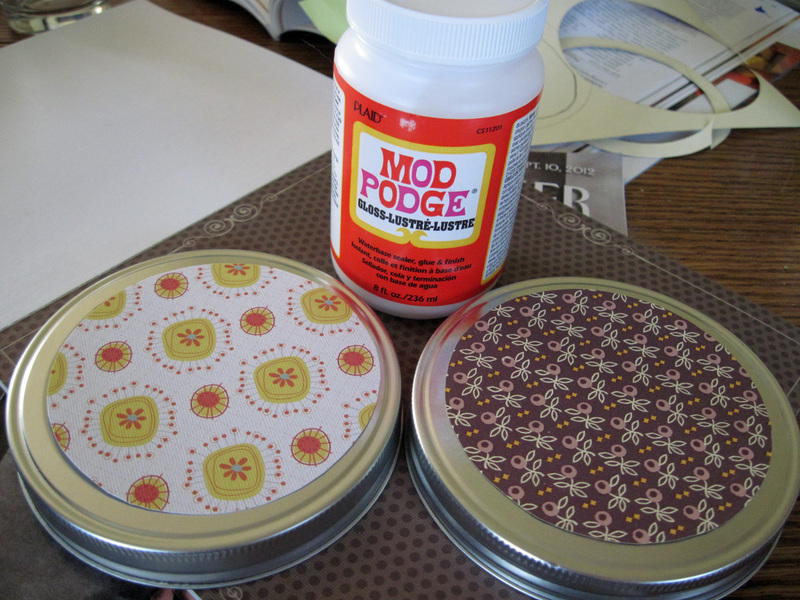 Then I used Mod Podge, which is glorious stuff, to affix the paper circles to the jars. I painted the Mod Podge on the lid, not the paper, with a foam brush (which I quickly rinsed well so I can use it again) After affixing the paper to the lids, I painted over the top of the paper, too, so that if the lids get splashed (they reside near the sink), it won’t ruin the paper. I won’t be scrubbing the lids in the sink any time soon, but at least I can wipe them down and not worry about ruining the paper. This was a five-minute project, but it was worth it! It’s the little things in life, you know. I recently completed a couple of projects I’ve been meaning to do for a while now. I made bumpers for Jonathan’s crib, and also a bib (which I will share in the next post). I decided to make the bumpers myself after reading this blog post and doing some research on what nice bumpers were likely to cost. For about a quarter of what I would pay to purchase the bumpers, I made my own. They’re not that great, but they’re better than nothing! And we needed something, because our son has a penchant for sticking his feet through the bars of his crib (and consequently his fat little legs get stuck and then he screams bloody murder), and he also scoots around in his sleep so much he kept banging his head against the bars of the crib. Waking up in the middle of the night to a screaming baby is not OK at this point. I used some fabric I already had on hand (my fabric stockpile has gotten a bit out of hand, and I’m trying to use what I have before buying more… though I did buy gingham for the bib, but more on that in my next post), but picked up some navy blue piping for decoration, navy blue ribbon for the ties, and foam for stiff padding. After the tedious measuring and fabric cutting stage (every project I do, I swear I hate measuring and cutting just a little bit more), I pinned together the fabric, piping and ribbon. I placed the ribbon at even intervals so there are ties on the ends and in the middle. I did, of course, run out of ribbon at the end, so I have one bumper with five ties on the top and one with four ties, but my baby sure isn’t going to notice something like that. It’s important if you’re making something like this yourself that the ribbon lays INSIDE the fabric, as shown below, as you pin, not the outside, or you’ll end up with the ribbon on the wrong side of the fabric. Though maybe I’m the only person who has to think that sort of thing through. I also use the same color pin (green in this case) to denote where the ribbon was so I sewed extra carefully in those spots. Anybody else give themselves visual clues like that? I sewed the top (with the piping) and the two sides before inserting the foam and sewing the foam in. I probably should have used buttons instead so I could remove the foam to wash the bumper fabric, but I decided to live on the wild side (a.k.a. I didn’t want to learn how to sew buttons this time around) and sew the foam in. Down the road I’ll inevitably have to wash the bumpers and when I do I’ll plan to wash them on a cold, gentle setting. And keep my fingers crossed. I left about an inch on all sides of the fabric to account not only for seams but also for the width of the foam. 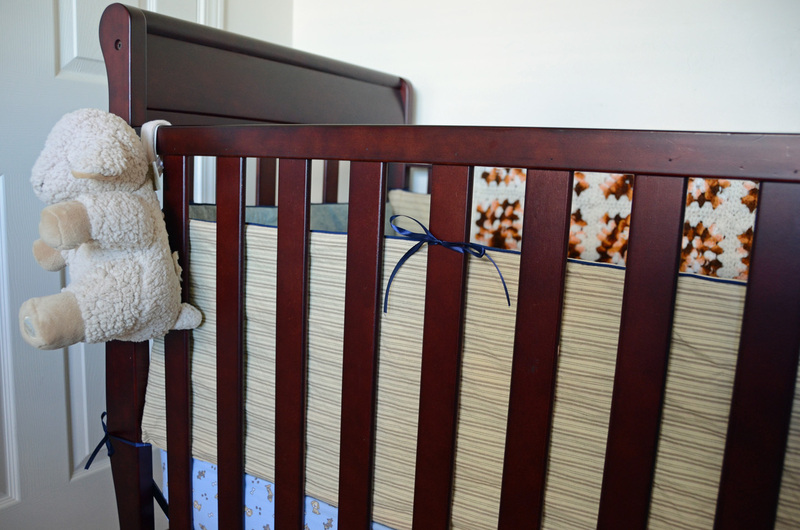 You can see the top of the crib bumper is actually a pale blue. The one on the bottom matches it. 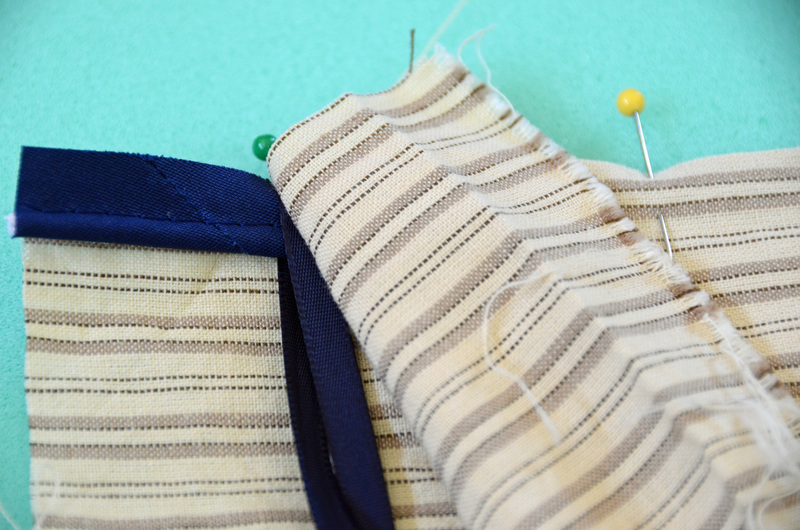 I didn’t have enough of either the pale blue or striped fabric to complete all four bumpers, but I thought the two fabrics went well together and the navy ties and piping help them match. Also, I think these bumpers are neutral enough for a baby girl’s crib in the future (no, I am not prego). I’m happy to report our days of stuck feet and bumped heads are over. Our little peanut seems to sleeping better at night. Mission accomplished! Just as I’ve introduced a series about gardening (view the first post here), I’m going to introduce another series called “Why buy it when you can make it?” that will include information about making things at home. For example, a few months back I made a makeup bag instead of buying one, and I am SO glad I made it myself. 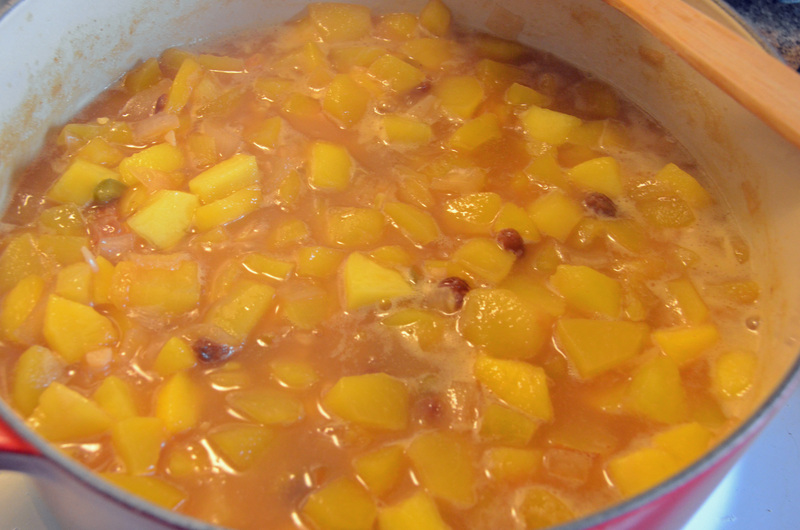 This post is about making peach chutney, which is delicious on pork chops and chicken. This will also be an occasional series, but I hope readers find it inspiring. Isn’t it so true that we value that which we make ourselves over that which we buy? So, I spent some time the past week canning peaches. Of course they’re not local peaches, since peaches don’t really grow where I live. But I think that sometimes it’s better to buy organically grown peaches from California while they are in season, can them, and then enjoy them in the winter, than to buy peaches out of season. I know I could buy them frozen, but they just don’t taste great. We so rarely buy food that we can get from right where we live, we consider things like peaches, bananas, and bell peppers a treat. I’ve always loved peaches, ever since I was little kid. 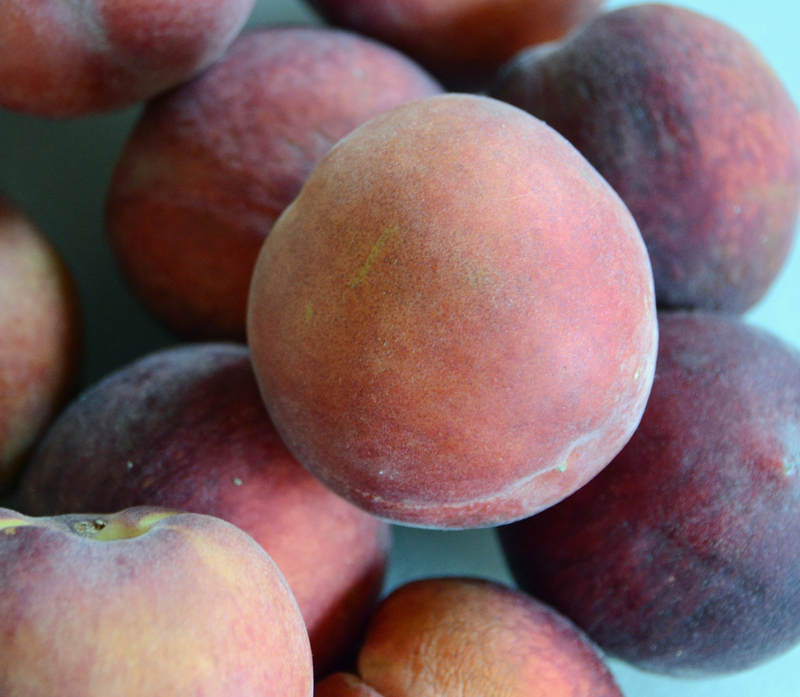 The first time I remember eating a peach is when I was probably five or six years old. We had spent the weekend at a cousin’s cabin in the mountains in Colorado and we were driving back to Denver. My mom handed me a peach. I remember watching the pine trees outside the window, the winding drive down mountain roads, and the fuzzy peach in my hands. I remember taking a bite of that luscious, succulent fruit, the juice spilling down my chin and onto my fingers. What a wonderful memory that is, that first peach. So last week, my husband and I bought something like 10 pounds of peaches on a couple separate occasions. I canned some into peach preserves first. Then I made chutney. I could buy both peach preserves and chutney at my local grocery store for about $5 a jar. Or I could enjoy jars I canned myself, without all the weird unpronounceable preservatives! I’m going to go through the process of making chutney here. 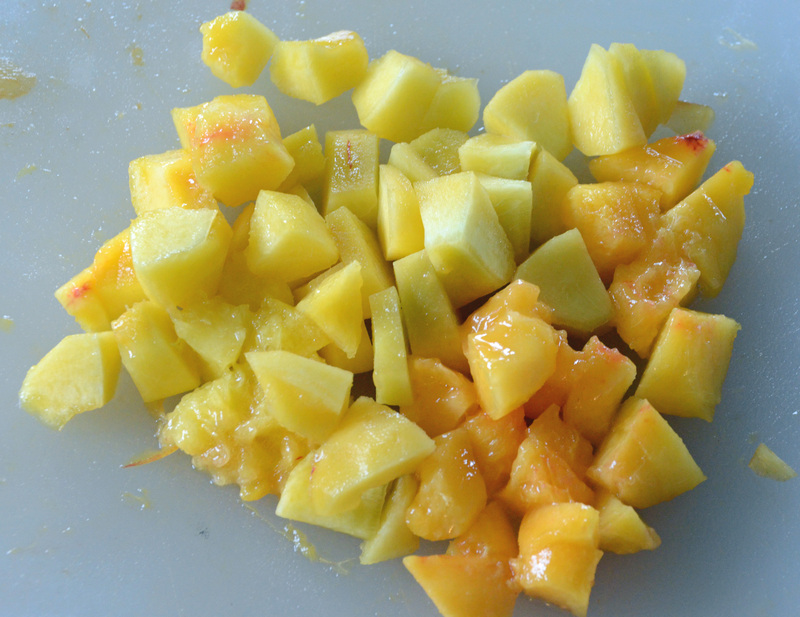 The peach chunks toward the righthand side of the photo are obviously much riper than the other chunks. That’s OK. When you’re canning, the ripeness doesn’t matter as much. Less ripe is actually better. Some of the chunks will cook down, so that’s why it’s better to have small, inch-sized bits. They cook down faster. The peaches go in a pot on the stove and simmer down some, mixed with brown sugar, raisins, chopped onion, a hot pepper (I used a Serrano and used the seeds too, which makes it even more spicy), mustard seed, ginger, salt, garlic, and vinegar. I use the Ball Blue Book for the recipe. I like the Blue Book because it is cheap, something of a canning authority (lots of information about methods and such), and easy to follow. I do have to note that many of the recipes I’ve tried often recommend the use of WAY more sugar than I use. When I canned peaches, I put in one and a half cups of sugar and the preserves were quite sweet. The book recommended SEVEN. So, sugar to taste is my recommendation. Making chutney is actually pickling, did you know that? Anything you can in vinegar is pickling. The above photo shows the consistency you’re striving for with the chutney. Lots of peach chunks left, but some cooked down into a syrup of sorts. While you’ve been making the chutney (from starting to peel the peaches to when the chutney is ready to can took us about an hour to an hour and a half), start your water bath boiling. It will take quite a while to heat the water bath to a rolling boil, so make sure you get that going in advance. As the chutney is cooking, you will boil the lids and the jars (their openings face-down in the water) for 10 minutes or so in a skillet with about an inch or two of water in it. This heats the jars so they don’t explode when you put them in the water bath, and it also sanitizes the jars and lids (you should have washed the jars and lids already, though). Cleanliness is absolutely essential in canning. While there are only a few cases of botulism reported annually (MANY more people come down with food poisoning because of dirty food from factories) in the U.S., that’s not something you want to mess with because it will kill you! You suffocate. Nasty. Make sure your equipment and workspace is clean! It’s also a good idea to check the lips of the jars for cracks or chips because this will interfere with the seal. Once the chutney has cooked to the point where you like the consistency, transfer it to the jars that have been boiling. You want to leave about 1/4 inch headspace. Wipe the rims down carefully with a clean washcloth dipped in the boiling water of the skillet. Be careful not to burn yourself! Make sure there is no residue on the rims or lips of the jar. Put the lid (Side note: the flat lids are the only piece of canning equipment you CANNOT reuse. One use only!) on, then tighten the screw top around the lid to as tight as you can with your hands. Carefully lower the jars into the water bath with canning tongs. Boil for 10 minutes (I go for 15, but I always go past the recommended time just to be safe). Here is the chutney as I pulling it out of the water bath. I used some pint-size jars and some of the smaller quilted glass jars as well. I like to give the quilted glass jars away as presents. Just as you appreciate something you made by hand more than something you bought, so others appreciate handmade gifts! Set the VERY HOT jars on a towel. Listen for the pops of the jars as they seal. You know they’ve sealed when the raised bump in the center of the lid is no longer there. If you have a can that didn’t seal, it’s OK to eat, but you must refrigerate it from the get-go. 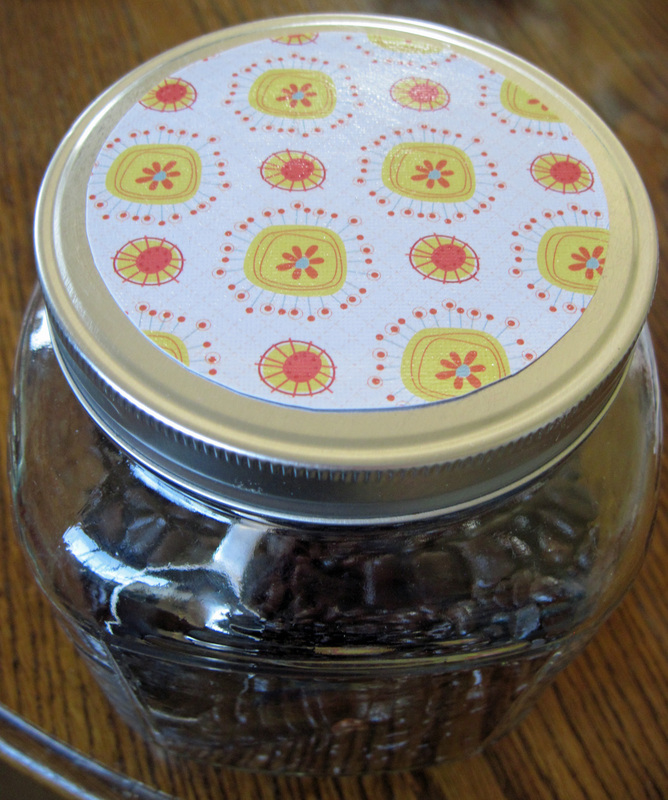 Once the jars are completely cool, remove the screw-tops. It is possible for bacteria to live in between the screw-tops and the jar. You don’t need the screw-tops when the jars are in storage if the jar is sealed. Once you open the jar to eat the chutney, you will obviously need the screw-tops. And you should always refrigerate canned goods once they are opened. Canning supplies can be found at many grocery stores. If you find canning jars in your grandma’s cellar, make sure the jars don’t have any cracks or chips; if they’re intact, they’re OK to use! Once you’ve made the initial investment in purchasing jars, lids, screw-tops, a water bath vat, canning tongs, pectin, and a funnel, everything (except the lids) can be used again and again. Canning is a fun way to preserve food. 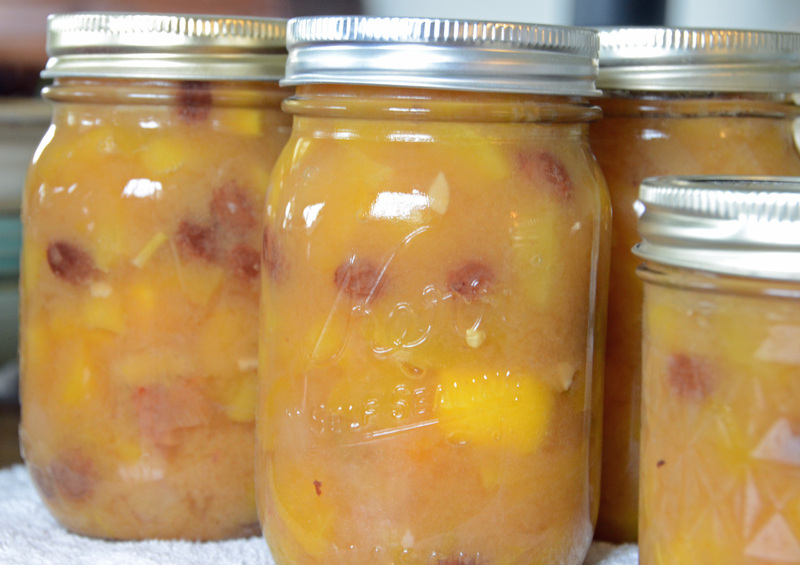 There’s nothing like peach chutney or applesauce in the depths of winter. And those jars always look so nice on the shelf! • Canning is not the best way to preserve nutrients in your food. The boiling breaks down some of the nutrients. The absolute best way to preserve food to maximize nutrients is to freeze. However, canning doesn’t require refrigeration. • The water bath method is only used for foods that have acid. Green beans, meat, fish, and the like must be canned using a pressure canner. • Read all canning instructions before canning. Canning is easy, but you must follow directions and make sure everything is very clean! I am not responsible if you give yourself botulism. But you shouldn’t have to worry about that at all if you have a clean working environment. Canning is a safe way to preserve food, but you need to follow the directions! 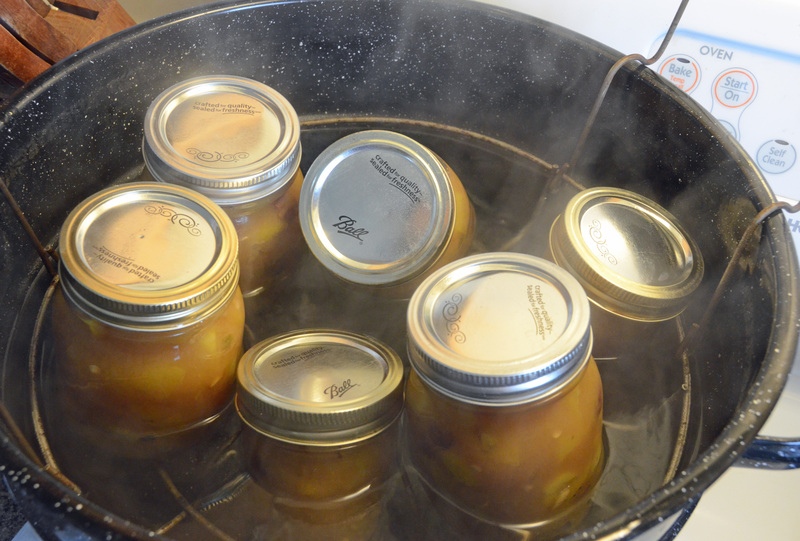 • I have heard that ceramic/glass-top stoves do not get hot enough for canning. Not sure if this is true or not, but perhaps using a coil or gas stove is best. 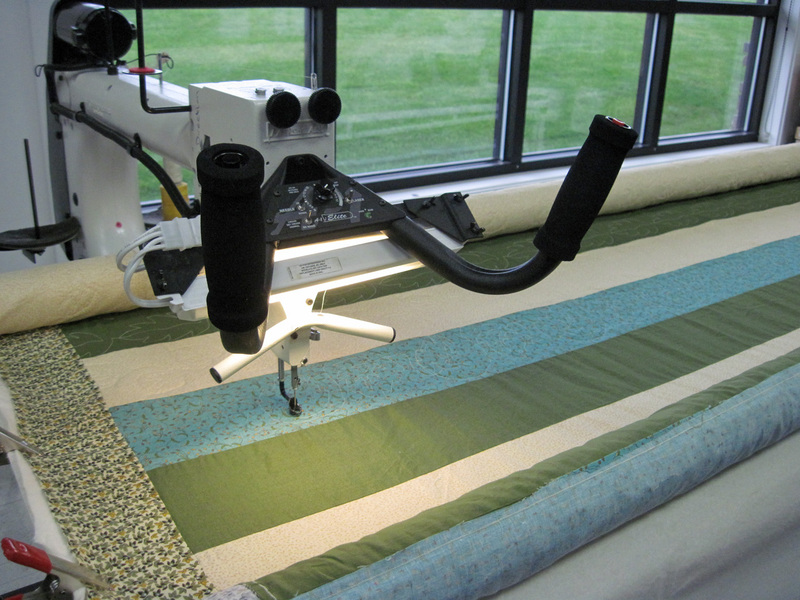 A local fabric store has a long arm quilting machine. The machine can be rented for the day. Yesterday I rented the machine to work on a quilt that I started three years ago, which I admit to my chagrin. It sat in my sewing desk for years, just a few squares from complete. I finally finished the “strippy” quilt top a few months ago, and the quilt bottom just a few days ago. Using the long arm quilting machine requires some gumption. The needle moves up and down very rapidly. I did a practice piece first using the freehand technique, but switched to following a pantagraph for the actual quilt. A pantagraph is a long scroll with a design on it. One follows the design, tracing it, with a laser on the long arm. 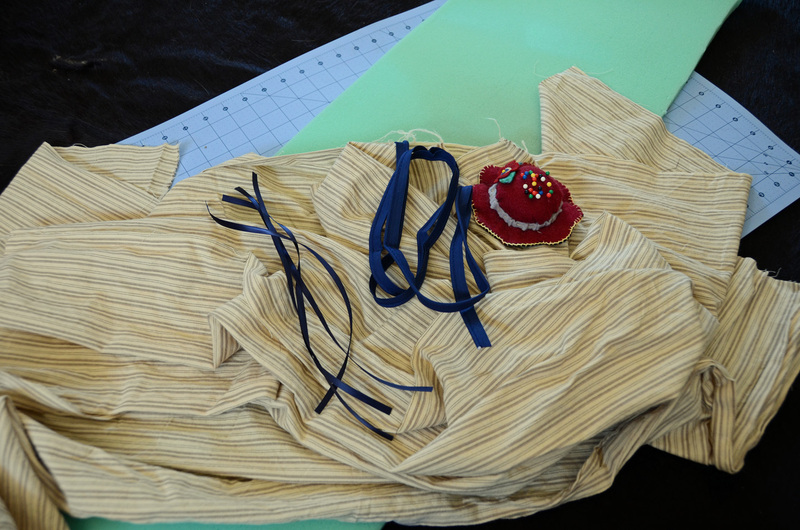 By following the template, the needle, which is in front of the laser about a foot, sews the pattern into the fabric. The first few rows were slightly terrifying. I didn’t want to mess up the design on several hundred dollars worth of fabric and a lot of time spent sewing that fabric together. But it got the hang of it after a while. That being said, the design I picked is fairly intricate (three different vining leaves) and it’s going to take a while. 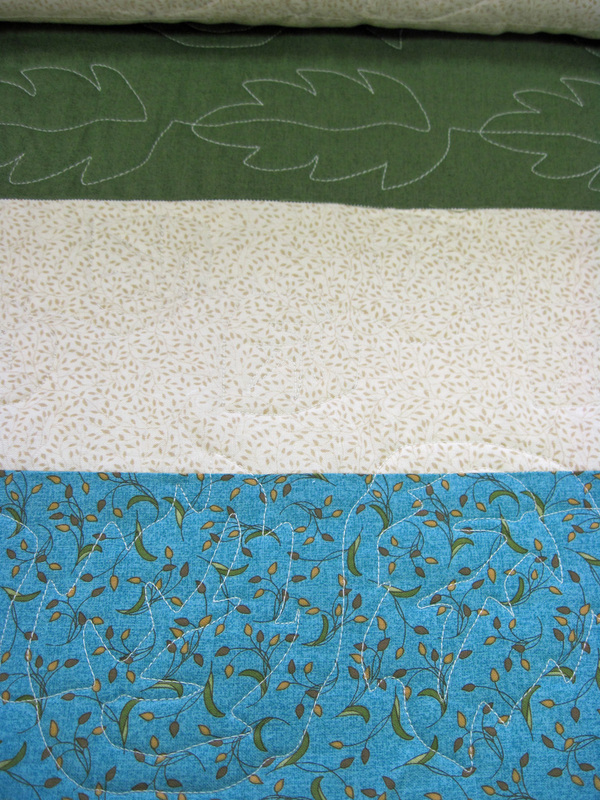 I’ll need to go back and use the machine at least once more to finish quilting. There is quilting on the lighter fabric, but it’s hard to see here. Doing the quilting using the long arm is so much faster than trying to do it at home on my sewing machine. Once finished, this will be the first quilt I’ve made entirely on my own. I’m excited to put it on our bed! Some mornings, you get stars in your oatmeal. How cool is that? Sometimes the best way to start the day is by noticing the little wonders all around us. Case in point: blueberry stars. Other such wonders include staring into the eyes of my darling son as he smiles up at me in the morning from his crib. How those eyes have changed and become his own over the past five months, and how I have enjoyed that transformation. Ordinary wonders like friendships. Recurring wonders like that feeling when you look at your spouse while he’s laughing and feel yourself falling in love all over again. Shawn and I are in a waiting period that has us both frustrated. We hate waiting. We are not patient people. We just want to get on with this new adventure and work hard to make it successful. 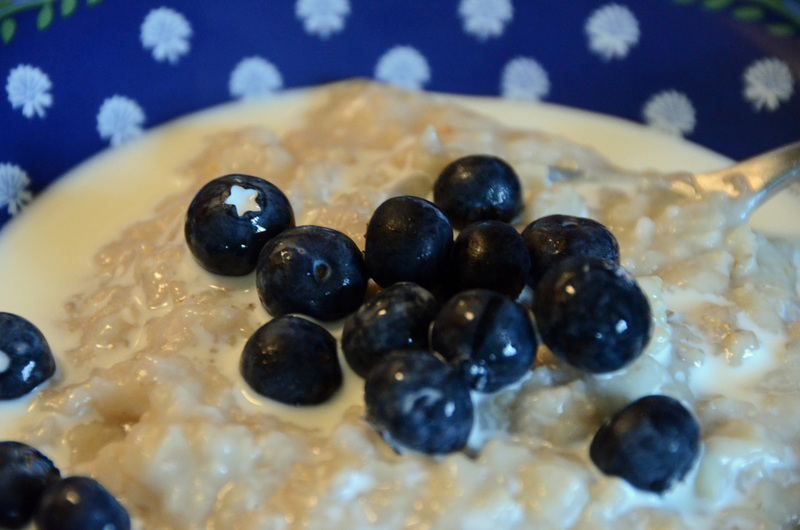 So it’s good to step back from that frustration and find little things worth appreciating, like stars in the blueberries, nestled in the morning oatmeal. 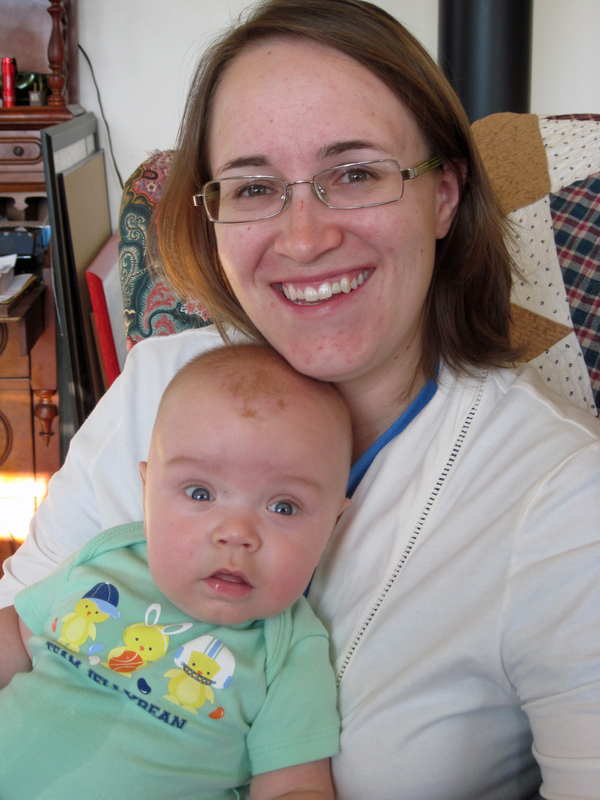 I’m so thankful for the reason I get to celebrate Mother’s Day this year: my son Jonathan. He’s the best. 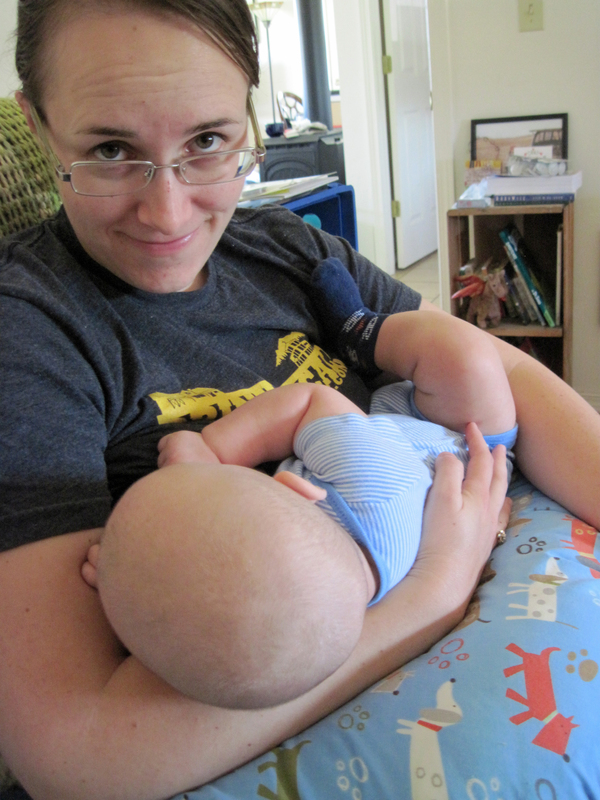 I’d also like to take the time to advocate for all the breastfeeding moms out there. It takes time, commitment, and tolerance of very sore lady parts. But the payoff and the time spent with one’s child, just the two of you together, is worth it. Great work, ladies!